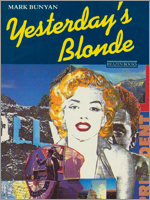 I wrote my first novel, Yesterday’s Blonde, in the late 80s and it was published in paperback by Brazen Books, a new imprint started by the manager of London’s Gay’s The Word bookshop, in September 1989. Being a paperback first novel it received few reviews but those that it did get were very positive. Sadly, like many new imprints, Brazen Books didn’t survive for more than a few titles and when they went under, the entire remaining print run of Yesterday’s Blonde was pulped. A few second hand copies are still available on Amazon websites. In August 2010 Yesterday’s Blonde became available on Amazon as a Kindle download where it’s been very well-received. 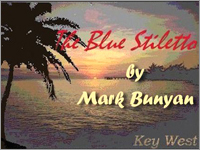 On this basis, we decided that my next opus should be more sizeable and The Blue Stiletto, a comedy thriller set on Key West in the late 1980s, was about four times the size of Yesterday’s Blonde. After a year or so of my sitting on the manuscript, Andrew decided that we should try to sell it as the first ever email serial. Setting this up was not easy - there were almost no facilities for taking money over the ‘net and banks were very, very wary. Nonetheless, in April 1998, The Blue Stiletto was the first ever book that you could buy as an email serial, a new episode to drop into your inbox every day for 127 days. It had subscribers across Europe. Five or so years later, Stephen King did exactly the same thing and everyone said what a brilliant idea he’d had. Sadly, it’s not a brilliant idea, even if your book is a Stephen King page-turner. With serials in previous media, from Dickens in magazines to Armistead Maupin and Alasdair McCall Smith in newspapers, there’s an urgency to reading the episode. If you don’t read today’s episode in a newspaper, it won’t be there tomorrow. Email however will be there tomorrow if you don’t get round to it today. And the day after that there’ll be three episodes you’ve not gotten around to and eventually an entire book. But you can now buy The Blue Stiletto for Kindle from Amazon.